Come experience this accurate tribute to the Hottest Band In the Land, KISS! Professional musicians make up this high-energy band, and they are dedicated to making it look and sound as authentic as possible to give you, the fans, an unforgettable KISS concert. 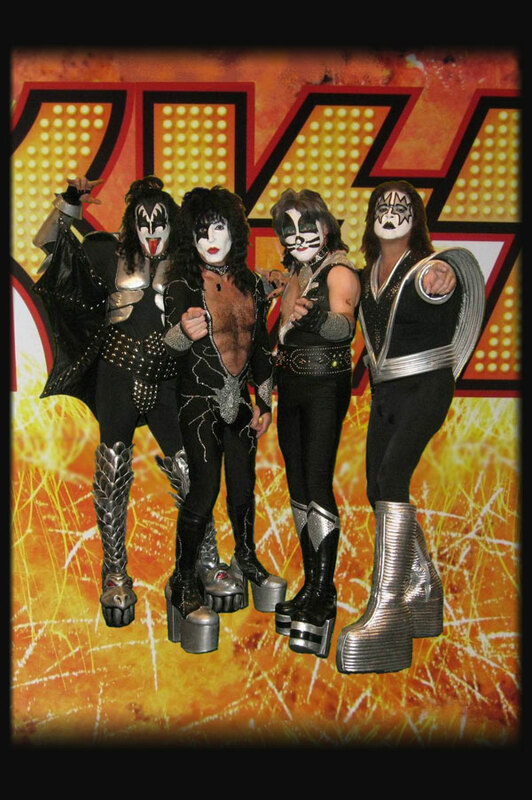 They pride themselves in their attention to details not only in their vocals and musicianship, but their replica costumes with 7″ platform boots, authentic KISS guitars, makeup, special effects, and stage set including their lighted KISS sign and wall of speakers. This exhilarating show delivers the classic KISS hits with all the smoke machines, sirens and firehouse lights, smoking guitar, showmanship, blood-spitting Gene, and excitement that will leave your clients saying, “Let‘s get ‘em back!” Songs include “Detroit Rock City”, “Rock and Roll All Night”, “Lick It Up”, and more. This friendly band enjoys meeting KISS fans, and after every show they are available for meet and greet, and photo ops. This show is perfect for corporate and private events, casino shows, bike rallies, and more! Wanna Book Las Vegas Kiss? You can book Las Vegas Kiss for your next event just by clicking the "Book Them Now" button to the right and filling out the form. We will be in contact with you about their availability as soon as possible.